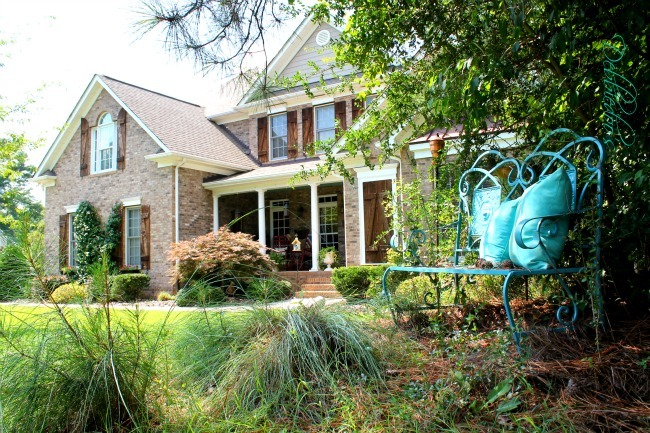 Thought I would share a quick little summer garden tour of our Carolina home. I am not a green thumb. It’s actually hard to believe my window boxes are still alive, or I should say the flowers planted are still alive. I suppose with all this rain it has helped. That is Jasmine btw growing up the middle. Been there for about 6 years and it really loves the full sun. I let nature take it’s course. My husband has to trim it some. The IVY in the URNS have been planted for at least 3 years. These urns were originally black and I painted them with Annie Sloan chalk paint a few years back. Another paint job holding up pretty well. This I believe is called creeping Jenny. I planted it around 4 years ago, and this is what it is doing today. You may remember my garden bench that I spray painted. and now currently blue, which is my favorite color. I am thinking it needs a refresher soon. Just not sure on color choice yet. all things green I can do! It has been a few years now since we have done the Stamped concrete. Although we do need it sealed this Fall again. I bought two of these cute solar knomes at the drug store. I believe for 12.00 a piece. They work pretty well too. We will be restaining this side deck here shortly. Hoping to try the new Rust-oleum Deck and concrete restore. not dead yet, but not great either. this is a whole lotta green. Hope you enjoyed my Carolina outdoor garden tour. 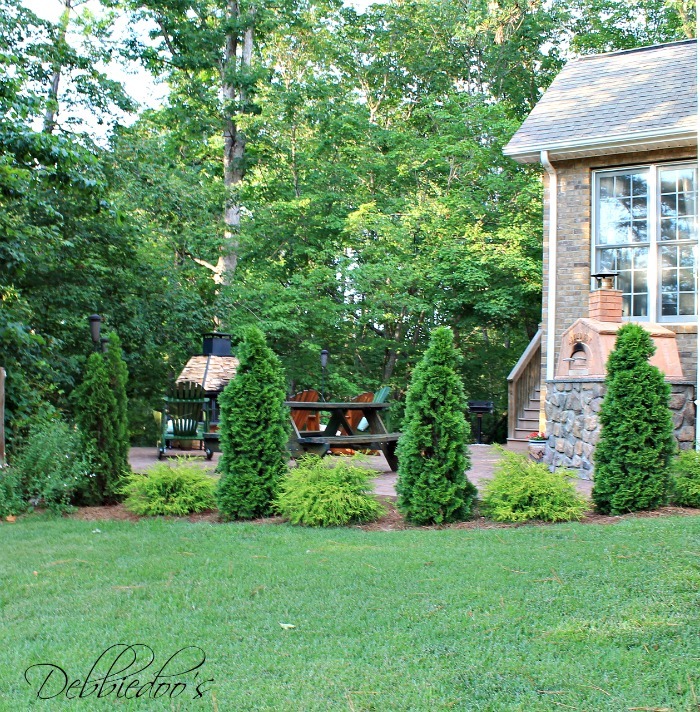 Your garden looks great Debbie! 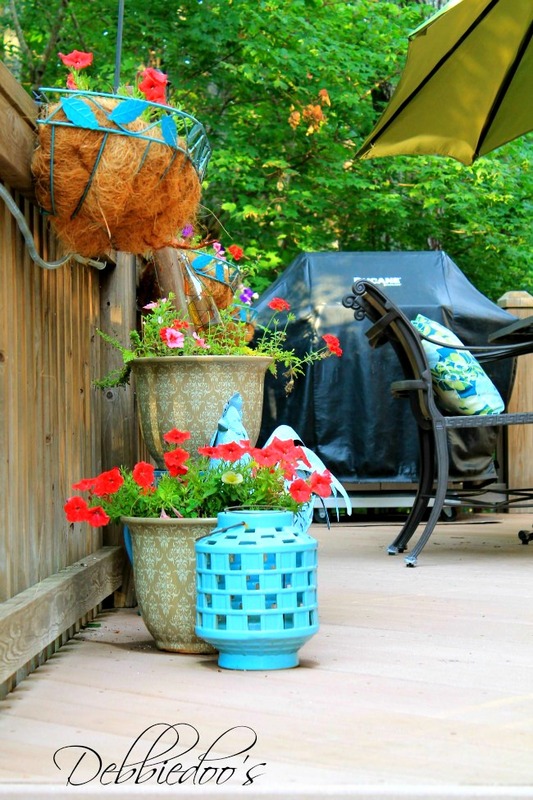 Good luck with your deck…Hopefully the majority of the rain is over and you can get it done. We are mostly finished with ours. I just have the stair railing to finish up. 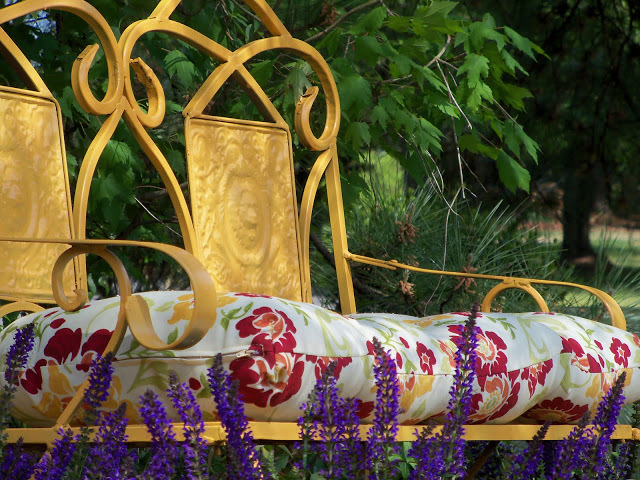 My fav part of the garden tour was the spray painted bench! Does that make me a bad person? lol. My poor flowers… not getting the attention I usually give them. They are doing okay, but sort of under appreciated with tools taking over their normal home. Your garden looks beautiful! 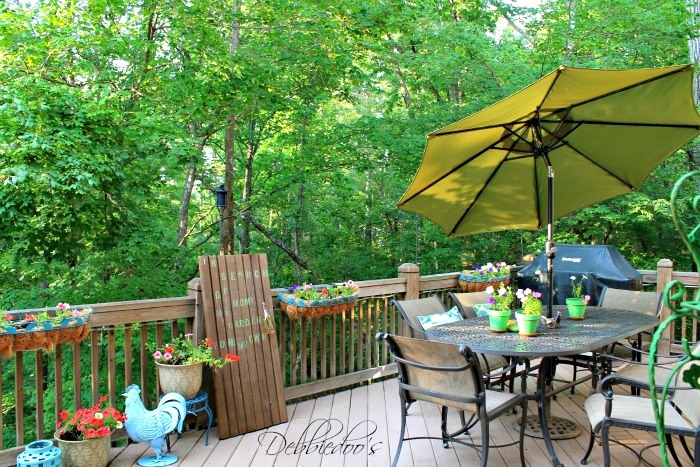 We need to redo our deck too, one of the MANY things on our to do list. I believe your climber is Creeping Fig. We have some growing on the brick around our screened porch, I love it! Could be you are right on the fig, I know it is creeping something LOL! That is for sure creeping fig. Debbie, fabulous curb appeal. I love your deck, and all the plants look very healthy! Looks green and lush. That jasmine has really gotten huge over the last few years. Fun watching it change from year to year. 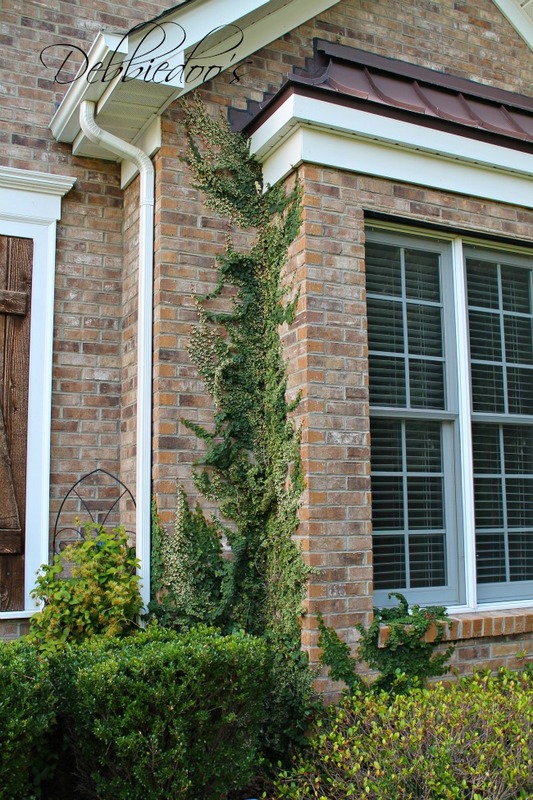 Love the creeping Jenny climbing the house. 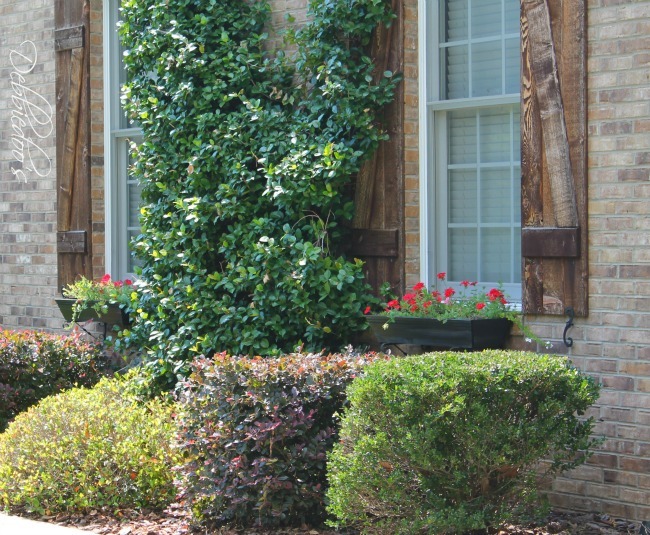 I love when homes have greenery growing on them. Hubby, not so much. So beautiful! 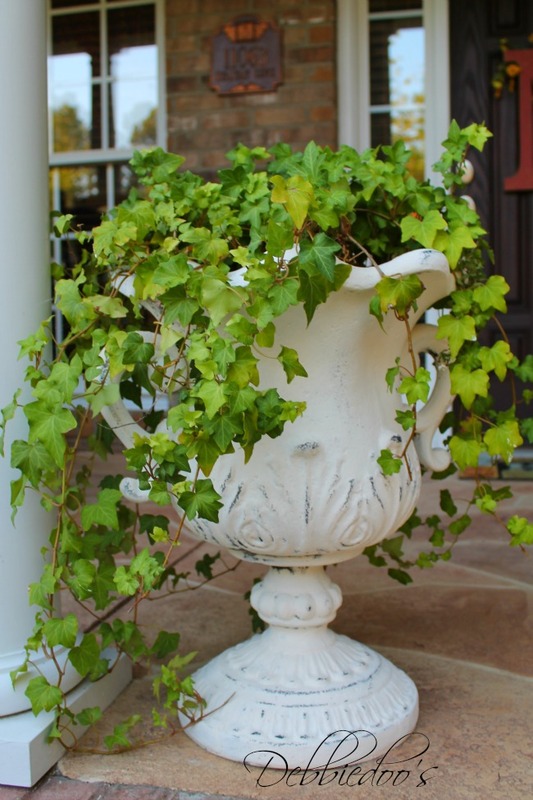 Love that you painted your urns with chalk paint! and that yellow bench is gorgeous. You’re Debbiedoo and I’m Debbietoo! Well, I just couldn’t resist that. 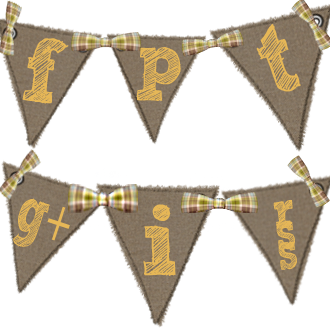 I love your blog, projects, home and yard. Is that a pizza oven on the patio? Did you build it? If so, would you share directions? I’m dying to build one. 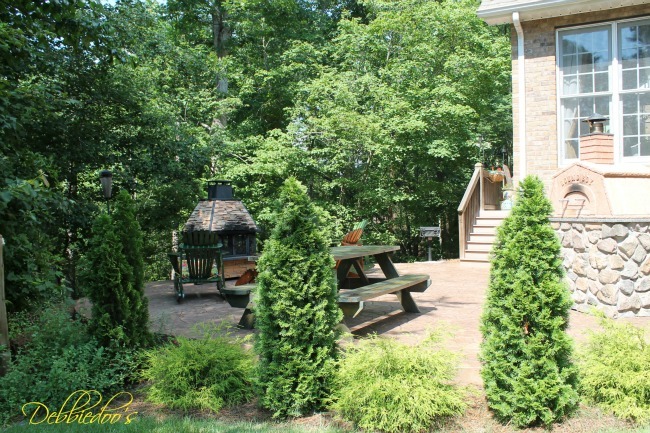 Debbie…I always so enjoy seeing your beautiful yard!….i love all of your wonderful potted plants and the urns that you painted…Looking forward to your color decision on the bench…it is so very pretty!! Have a great week Debbie! Your home is lovely, and welcoming! I would love to sit there on that patio and sip some tea with you. You’ve got lovely gardens, Debbie! The greens are important, too! 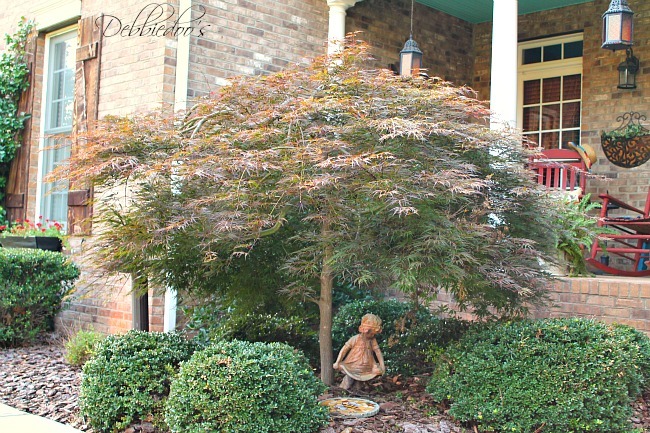 Love your Japanese Maple. I’m looking to have a round bushy evergreen taken out by our front entrance and I’d like to get a small Japanese Maple to put in its place. It will not come onto the cement like the evergreen is doing, plus I’m hoping it will give us a little bit of shade down the road. Your property is Amazing!! You have a Lovely Home Inside and Out. Except for the Scary Gnome!! I had inherited a bunch of them and sadly they went in the yard sale because then I found out the ones from the 50s and those are the ones I had the one with the tall red had is worth something like $50,000 So now I really don’t like them lol. Your yard looks fabulous! Love the idea of a pizza oven!!! Hmmmm…..got me thinking! LOL!! 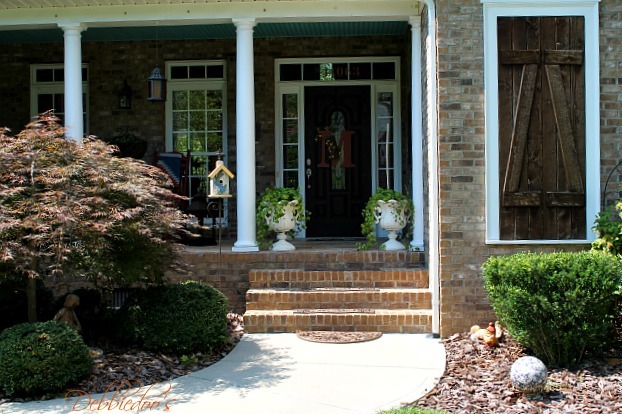 I love your urns out front! I have the very same urns (only black) and I’m thinking the white is a great change, especially with the holidays coming! Thanks for sharing, Debbie!! Your yard is lovely. I just wanted to warn you about the Deck Restorer from Rustoleum. We put this on our deck floor last summer. It is all peeling up. About $200.00 worth of product that I now have to scrape off. We only really need it for the rails and our side mud room entry. I hope that does not happen. We still need to do more research before we take that chance though. Thank you for the info. Flowers are over-rated. I like all the shades of green you have going on. 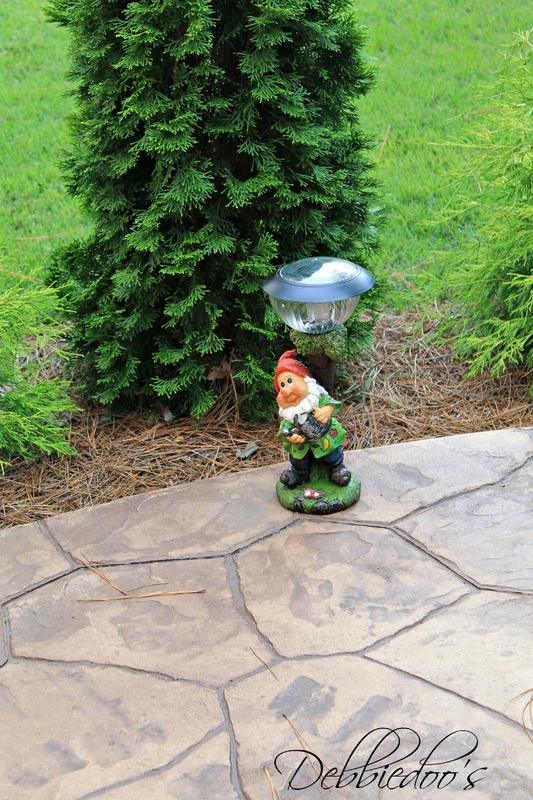 And that little gnome light is too cute. I don’t think you give yourself enough credit, Debbie! Everything looks neat and healthy and pretty! Gardening is not easy and you have done really well, I bet you get lot of compliments. 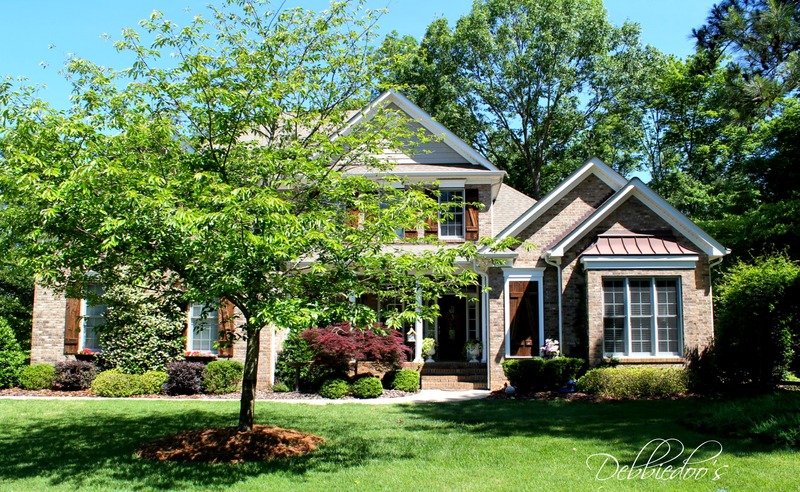 I just love seeing pictures of your home, it’s beautiful inside and out! Thank you Jane, the green is certainly green, but I don’t have anything to do with that LOL. I appreciate your kind words. Thanks for sharing your space with us! Things are looking good in your garden Debbie! Your gnomes are too cute! I think it all looks terrific. Ours started out fine this year, but I swear we are totally waterlogged. Nothing like “feast and famine” in Dixie. UGH. I hope you get some sunshine to work on the deck (which still looks great, IMO.) I wanted to do a new stain job or restoration this year, but just like you we have been too wet. Mine are alive too, hanging on by a thread. Next year lets bring plasty back. Thanks for the garden tour — it all looks fabulous to me! I love the blue painted bench, too. 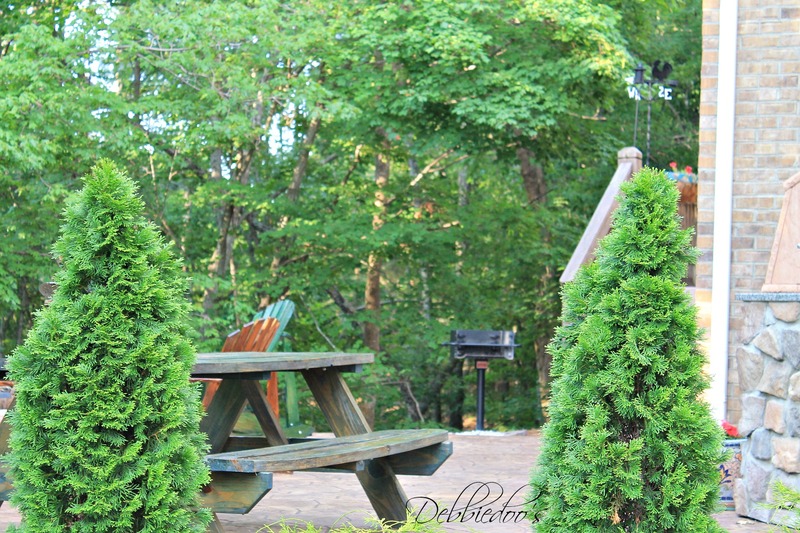 Beautiful Debbie! I own a home in Wilmington NC but I am currently at my home in FL sweating my B double O T Y off!! I plan to be coming back up in the Fall for a while but if you keep showing photos like that I am not sure if I can wait that long…lol. Your home reminds me of mine except mine is a 1 story. My Mother and Dad bought the home in 1973 and she was a member of the garden club in our subdivision so the yard was lovely for years. I am like you with no green thumb but everything green she planted still thrives (crape myrtles, azalea’s, ivy like yours that grows on the back of the home (as you said nothing will kill it) and dogwoods mostly white but I do have a large pink one which is almost rare to see now. 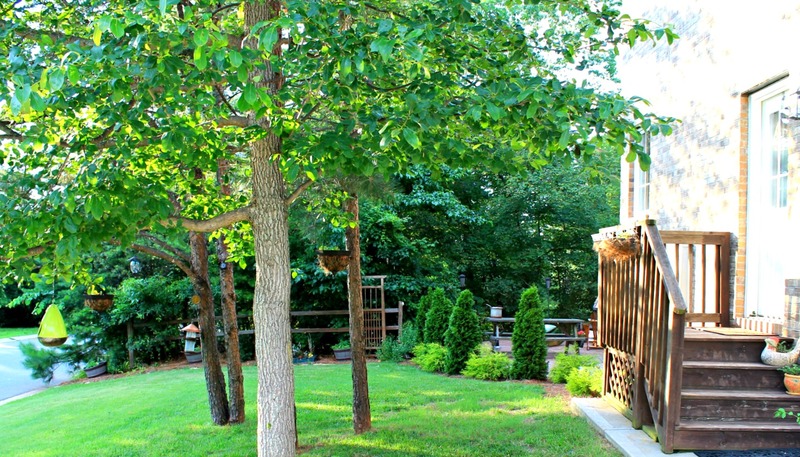 Thank you for giving us a tour of your lovely yard although it does make me yearn to be there in NC. Thank you so much for your sweet comment. We sure love living in the Carolina’s! You are very welcome and thank you for taking the time to reply. I love living in the Carolina’s and the people that live that are so warm and friendly.